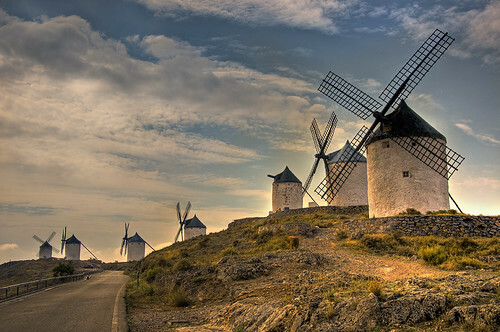 Attacking the windmills by Don Quixote, the legendary fictional character, is one of the most well known episodes of the famous novel, "The Ingenious Hidalgo Don Quixote of La Mancha" written by Spanish author Miguel de Cervantes. The novel published in early 17th century is considered as the founding work of modern Western literature and is amongst the World's most read novels. The very word quixotic has been derived from the name of the novel's main character - Don Quixote, who considers himself a knight and sets out in search of adventure and fight evil. 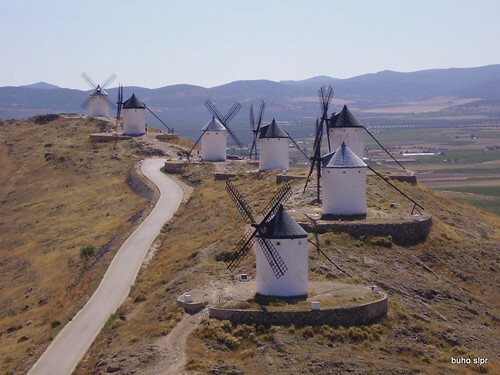 During course of his travels he saw several wind mills in La Mancha and made futile attacks on the mills thinking that these were evil giants with huge hands. 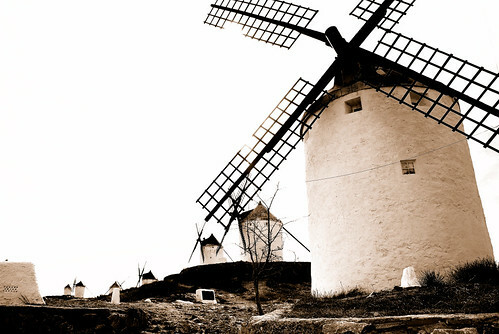 It is believed that the Miguel de Cervantes was inspired by the windmills near the town of Consuegra in Toledo, Spain. Originally there were 13 mills, out of which 12 have survived. These were functional till early 1980 and are now preserved as part of heritage and history. Credits: Gregg1956, member/explorer Google Earth Community (GEC) whose post in GEC entitled 'Jousting With Giants' brought this location to my knowledge. Wow, you have used two of my photos from two different continents! Being Armchair Traveller, I depend heavily on photographers like you who not only take great pictures but share the same with the World.